On a spin over Y Mynydd Du today we stopped to make a brew in the layby where the cavers park for the Lygad Lwchwr. 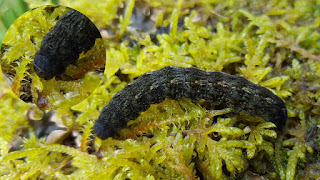 I photographed an unfamiliar caterpillar which I found amongst the scree (presumably Millstone Grit?) at SN67371782. After checking Porter & online images, it looks a perfect fit for Northern Rustic, a larval stage tick for me. Welcome back to Carms, Barry. 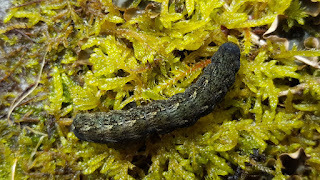 I`ve caught adult northern rustics very close to your site at nearby Palycwrt and there are other records from the Mynydd Du area. The block scree that you examined is indeed Millstone Grit (though the adjacent Palycwrt enclosure is on Carb. Lst.). I`ve often thought that the block scree area needed more regular visits to see what `s there, so well done. Come to Carms more often!